The knives are seemingly already out for Ponting and his team after they failed to secure a win on the last day of the first test. Questions are being asked whether Ponting left the declaration too late. Ponting and the Australian team will be under tremendous pressure come Melbourne to save what has already been a disappointing year for the Australian public in both rugby and cricket. Perth - Jacques Rudolph's unbeaten century from an entire day at the crease saved South Africa in the first cricket Test, enabling the Proteas to draw Australia after being set a world-record run chase of 491 runs to win. Rudolph, who resumed at 18 not out Tuesday morning, survived all three sessions to post 102 and turn what looked like a certain loss into a morale-boosting draw ahead of the second Test on December 26 in Melbourne and the third starting January 2 in Sydney. At stumps on Tuesday, South Africa were 287 for five wickets, losing just three wickets on the final day. Australia scored 258 and 528-8 declared in its innings, including Brad Hodge's 203 not out, while South Africa scored 296 in its first innings. "I think it was a very strong performance," said South African captain Graeme Smith. "The top six we had is very young in terms of age and games and to go up against some of the best bowlers in the world and to play the way we did today showed a lot of character." Smith said Hodge's push towards a double century in Australia's second innings had caused problems for Ponting. "I think he got himself in a bit of a predicament though when he pushed on a bit and Hodge got close to 200," Smith said. "Certainly he gave us no option of chasing down the target. "Having a day and a session to chase 500 (491 to win) doesn't give you a lot of options to go and win a game." 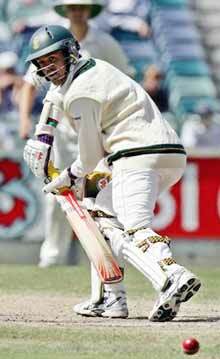 Ponting defended his bowlers, and his decision to bat on in Australia's second innings. "One hundred and 26 overs, we thought that was going to be plenty of time," Ponting said. "The attack I thought did a pretty good job in the conditions we had. The wicket was incredibly flat, especially for the fast bowlers." He also defended his decision to allow his side to bat on until an early tea was taken on the fourth day. "That wasn't ever a motivating factor," Ponting said of Hodge's pursuit of a double century. "We were actually going to pull out a bit before that and then he got a bit of a move on." Yeah, Terry Alderman said this morning already if Australia failed today the knives would be out. Even said he'd be at the press conference for ABC to ask some pointed questions and was especially inulting about the Lara thing. Must say that the Lara thing was probably more of sour grapes than anything else. There's also the opinion that if you cannot bowl out a side in four sessions you don't deserve to win. the commentator mentioned it was the first time since 1998 or something that australia could not manage to bowl a side out on the last day with warne in the team - and guess who that team was!!!! i wish we could give these Aussies a pakslae, then their sport is really in a mess. rasputin broke the story here before it was on IOL!!!! That was a scoop for us! They were still trying to interview people on CNN and Ras had broken it here already!!! That's a bit harsh boet, although if you can't bowl a side out on Day 5, you are not a deserving winner. That was Jacques Kallis coming to the party and the invention of his name the Aussies gave him as a nick that's apparently stuck. "Aw just ignore the c*nt. He's in a bubble. He can't hear us"
ja guys, i know we had the story here on this site. what im asking is why the SA media hasnt picked it up or said anything about it. the assies are always giving it to us and it is time they get some of their own medicine. Ali Bacher was the last good one. And he was a tried tested hardened and absolute Joburger.